This is a webscript, i have made, to create a Set of the new *.HDV entries for rFactor2 that replaces the old *Gear.ini. There is no Download-Link, because it can be used online. Notice:It's a free webspace, so please be patient, because sometimes it's very slowly. Please report here if you find errors or have suggestions to improve the Tool. I've added a new Feature. 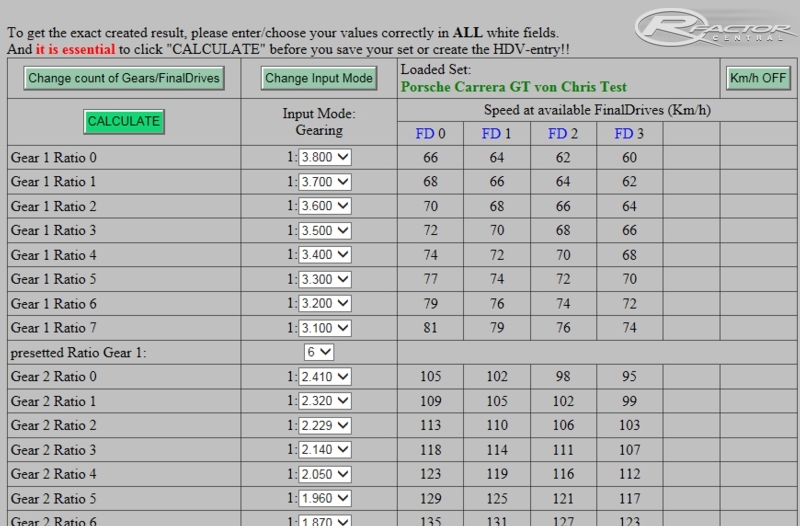 You can upload a *.HDV and according *Gears.ini file and the Script converts the Data into the new rFactor 2 Format. Unfortunately there went something wrong here, that i can't edit the Description of my Tool. Anyway..... i have added a little "Help-Page" now, that opens when you click the Blue Button with the Question Mark. It includes a Step by Step Instruction how to use the Tool, by using an old rFactor1 Gear.ini as Example. thank you for the comment and suggestion. I normally hate to read "manuals", because most of them make things more worse as they would help. And so i never thought about to add one. But you may be right. I'll try to add some helpful instructions to the script next time. This tool could be useful for RF2 modders...but..
Why don't You put any explanation screenshot, helping in understanding how to use your editor? Why don't You make a small tuttorial? Should we see in "old" Rf1 files the strings in HDV gear setting, or in the Gear file, in order to fill your editor pictures? Maybe for someone these may be obvious arguments...but not for me. Thank You for your replays...hoping also in the future You will release a "free" editor.